I'm parting from the usual way I write a travelogue for this post. 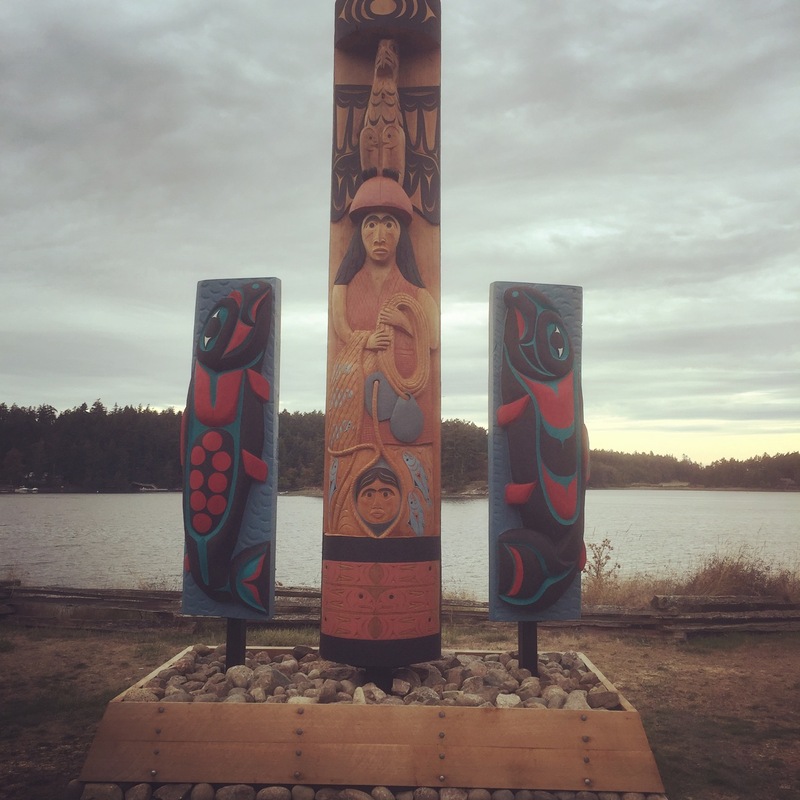 Here are some general impressions and highlights of our trip to San Juan Island, Washington. We took a bus from Seattle to the Anacortes Ferry Terminal, then caught the Washington State Department of Transportation ferry to Friday Harbor at San Juan Island. This journey took about four hours total. I wish I'd planned our trip for before Labor Day when the Victoria Clipper boat travels straight from downtown Seattle to Friday Harbor on San Juan Island almost daily during the high tourist season. We would have preferred to travel this more direct and scenic way. Full disclosure: I don't love bus fumes or watching people disembark at sad casinos on the way to my destination. The bus (actually a big bus to a smaller second shuttle bus) was a bummer. Once we boarded the ferry to San Juan Island, I anticipated the remoteness of our destination with a sense of optimism. The views from the deck of the ferry were beautiful and idyllic: mountains, hills, trees, clean water and lots of birds. There are no bridges to drive to the island. One arrives to the island via boat or small aircraft. Cars are allowed on the island. The Washington State ferry transports cars along with people to the island. By our second day on the island, I started to sense the downside to the remoteness of this island that depends on tourism for much of its economy. We were there during the very last week of the tourist season. About half of the resident islanders we encountered seemed emotionally exhausted and/or wary of visitors. I'm sure the tourism board of San Juan Island would take issue with this opinion of mine. I've spent the vast majority of my working life in service jobs in retail, child care and pet care. I sympathize strongly with people who are weary of slapping a customer service ready smile on their tired face day after day. Had we chosen to visit San Juan Island in May or early June, nearer to the start of tourist season, I bet we would have felt more welcome. Islanders call the mainland of Washington state "America", despite being Americans and residents of Washington state. Here's some awful context for why the residents may have felt emotionally skittish during our visit. 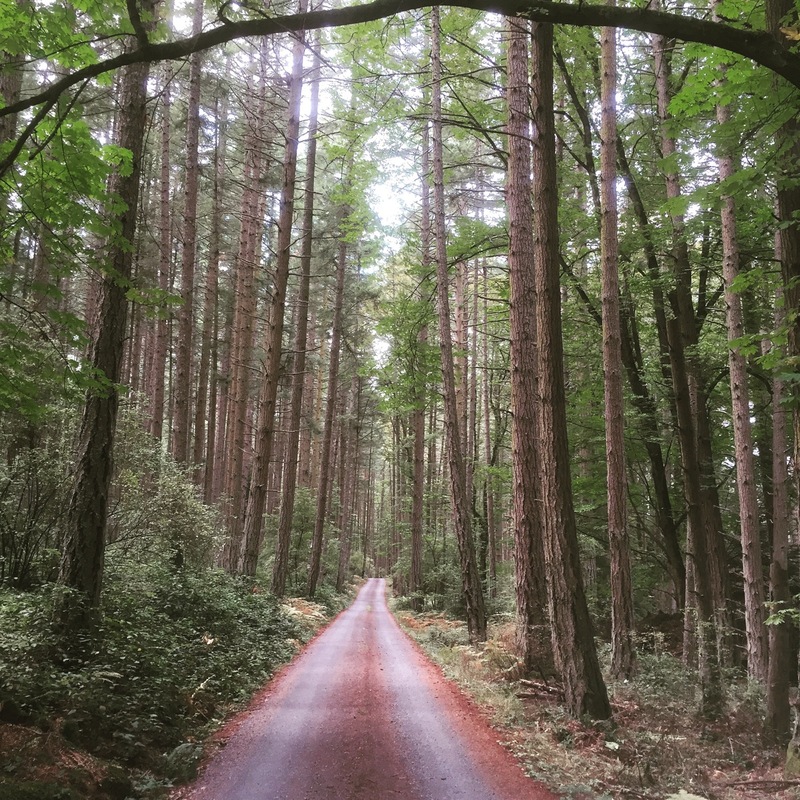 Two tourists were part of a murder-suicide on Lopez Island (part of the San Juan Islands) just weeks before our visit. A San Juan Island resident of Friday Harbor allegedly murdered his wife in their home just days before our visit. That's an extraordinary amount of violent crime happening in a small, remote, close-knit community in a short time span. Chad and I still had varying degrees of upper respiratory illness during this trip. I'm sure that added to my less-than-glowing impression of our vacation destination. There's the bad and the ugly, up front and out of the way. Let's get to the good! We loved our lunch at Herb's Tavern, a Friday Harbor institution. Herb's Tavern has a sense of history, but you won't find any dusty corners. This very clean and appropriately, but not overly, friendly tavern is conveniently located within stumbling distance of the ferry landing in Friday Harbor. Chad had the best veggie burger ever with a small mountain of perfect fries. I had a big house salad that was fresh, delicious and just what I needed. We felt welcome here. 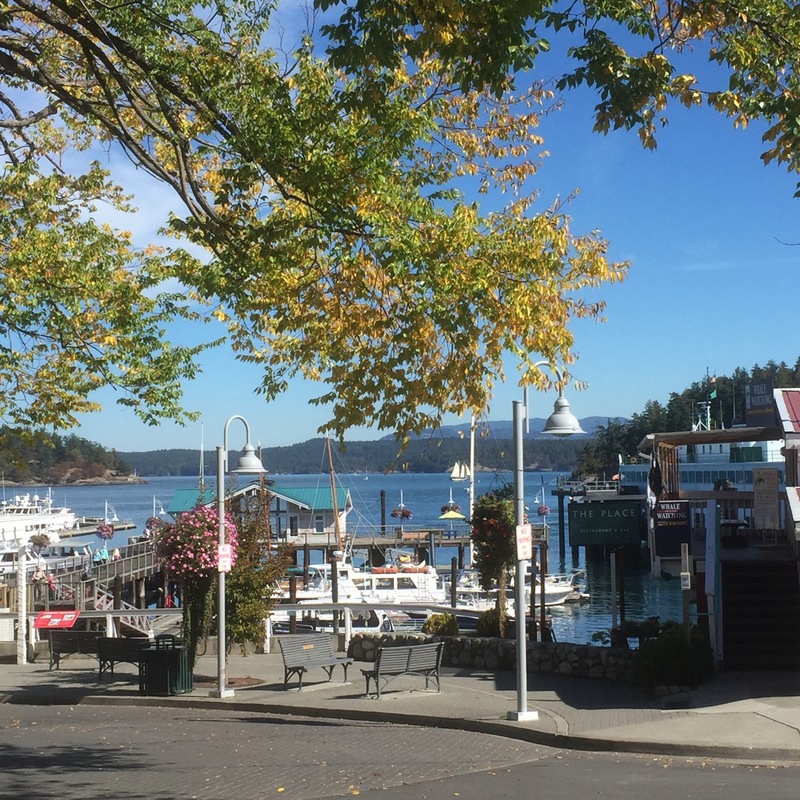 We liked the charming look of Friday Harbor. The waterfront is beautiful. The main part of town looks very old-school Americana and quaint. There are lovely hanging planters overflowing with blooms. The little movie theater has two screens, but no website. You have to call the theater to hear a recorded message with show times. The main day spa in town shares a wall with a really cute gas station. The Pelindaba Lavender shop sells lavender goods from the farm on the island, and wafts soothing scents for a 250 foot radius around the shop. There are plenty of restaurants to choose from in the main part of town. Of course, there are plenty of t-shirt shops. The good-sized grocery store had lots of delicious apples grown in Washington state when we visited. Yum! There was a lovely, friendly, vegan restaurant on this semi-remote island! Mike's Cafe and Wine Bar was just steps from our hotel. Located in a sweet former residential house with a lovely outdoor dining area, this is the kind of place that I'd love to have in Austin. The menu was refreshingly diverse for a plant-based restaurant. Chad loved his "crabby" cakes served with mashed cauliflower and perfectly steamed broccolini. I enjoyed a BBQ "chicken" pizza. For the less adventurous diners, a hummus platter with fresh raw veggies and pita bread was on the menu. In 1859, the United States of America and Great Britain agreed that San Juan Island would be occupied by military from both nations until a water boundary dispute could be settled. English Camp was established on one end of the island and American Camp on the other end of the island. Chad and I spent five hours hiking all over English Camp. We had most of the trails to ourselves that day. We especially enjoyed the waterfront views from Bell Point and Westcott Bay. We encountered a giant red-headed woodpecker pecking at trees with the force of a jackhammer. We admired him for a few minutes. He fled the scene as soon as we reached for our camera phones. We also tiptoed gently past a couple of groups of baby deer and mama deer. We spotted a few giant spiders and their webs from respectful distances. The Parade Grounds and English Cemetery had informational plaques with old barracks and headstones still in place. Hiking at English Camp was our favorite activity on San Juan Island. A very close second for our favorite activity was a whale watching boat tour around the San Juan Islands. We took a four hour cruise with Crystal Seas Whale Watching on board The Odyssey. The Odyssey is a large, comfortable boat with bathrooms, enclosed viewing areas and open deck viewing areas. There were two enthusiastic and knowledgeable "naturalists" on board to help identify wildlife, talk about whale history and answer questions. We were a bit late in the season to spot any orcas, but we saw a bald eagle, harbor porpoise, seals, sea lions and a pair of minke whales fishing near each other. The minke whales were impressive! I was thrilled to see the amount of wildlife that we did, especially from such a comfortable setting. If you go to San Juan Island, I highly recommend Crystal Seas Whale Watching. We did not have a car on the island. We enjoyed being able to walk to everything in the main part of Friday Harbor. We bought a day pass for the San Juan Transit bus to shuttle to the Pelindaba Lavender Farm, Krystal Acres Alpaca Farm, the outdoor sculpture park, Lime Kiln Point Park, the above-mentioned English Camp and other island destinations. This mode of transportation was much cheaper than taking a cab everywhere or renting a car. We enjoyed the humorous, colorful and informative commentary from the shuttle driver. The shuttle adhered to the scheduled stops punctually. On our travel day to get home, we set the alarm clock for 4:15 AM to make the cruel early hour of our departure on the 5:45 AM ferry. After arriving at the Anacortes ferry station we then had to wait two hours for a small shuttle bus which took us to a larger shuttle bus which took us to Seattle Tacoma Airport. There we stood in a ridiculously long line to check in for the four hour long Southwest Airlines flight home. I was so ready to get home to my terrible pets (each of whom I love fiercely) and my own bed. I'm glad that we went to San Juan Island, Washington. I doubt that I'll return, because it was laborious to travel there from Austin. There are too many other wonderful places on this planet that I haven't seen yet.